Massimizza il tuo tempo al porto con questa escursione privata di una giornata intera a Roma. Incontra la tua guida di lingua inglese a Civitavecchia e parti per una giornata accuratamente curata di visite turistiche pensate per soddisfare i tuoi interessi. Immagina l'età dei gladiatori e degli imperatori con una visita al Colosseo o al Foro Romano, esplora piazze e fontane barocche o ammira la maestosa collezione d'arte in Vaticano. Sia che tu voglia vedere le attrazioni antiche o le gemme nascoste, la tua guida ti aiuterà a sfruttare al massimo la tua giornata a Roma. We booked a Mediterranean cruise and couldn't find any excursions offered that would hit all the places that we wanted to see in one short day. We were a little hesitant about booking outside of the cruise options, but Viator guaranteed our return to the ship, so we chose this tour. Our only regret now is the fact that we only had a day in Rome. Davide met us just outside the terminal with an easy to read sign. He was so pleasant and personable, that the ride from Civitavecchia into the city seemed to take no time at all. By the time we reached the walls of the city, we felt like long lost relations. We needed to meet our guide for the Colosseum, Forum and Palatine Hill at a predetermined spot outside the Colosseum, so Davide parked, walked us over and exchanged numbers with Eva. Shortly before our tour was over, he had called to check on the times and arranged to pick us up. We had a list of places to see, but we needed to have lunch, and let Davide recommend a small restaurant off the beaten path. He took us to Campo de Fiori, where we sampled some very tasty local pasta dishes and one of the best lasagnas we've ever had, at a very reasonable price. Once fed, we were off to the Pantheon, Trevi Fountain and Piazza Navona. Davide even managed to eke out some time to visit Vatican City and at least see the square outside the Basilica. Even managed to get some pictures of the Swiss Guard. The day was over all too quickly, and although there was still so much more to see, we were more than pleased to have had Davide as our guide for the day. 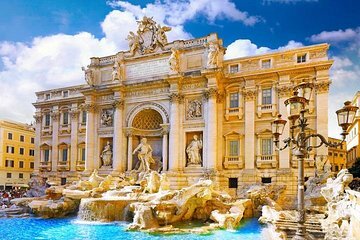 Hopefully the coin tossed in the Trevi will bring us back. Mateo was an amazing driver and tour guide. We got off the ship about 15 minutes earlier than our meeting time. He was waiting for us with a sign, professionally dressed and had a Mercedez Minivan waiting very close by with tons of cold bottled water. Mateo took great interest in what was important to us, and customized our trip the way we wanted it. He was always where he said he would be each time he dropped us off or picked us up. He even gave us a European pre-paid phone to take with us and call him in case he had to move the car. Being in a foreign country, small details like this really helped us feel safe and secure. He was very knowledgeable about Rome, knew his way around the city, and had great recommendations for everything including lunch. At our request, he took us to a place where only locals ate, and we had the best pasta of our life! I would absolutely recommend this tour, and Mateo! Our driver Franchesco was amazing!! he was waiting as soon as we got out of the boat and took us everywhere that we needed, we traveled with our two kids and he was so good with them, before we arrived to almost every site he will have his ipad ready to give the kids some of the history of the place!!! He even invited us for gelato and gave us an olive oil bottle!!! Rome is a very big place and full of tourists, very difficult to see much in a day but our driver Davide was excellent and very efficient in showing us the highlights of the city. He also had a great recommendation for lunch in Rome. Vehicle was clean, reliable and he was on time picking us up and dropping us off. We had a private tour with Faust. He went out of his way to make our day special. He even took us to see the LDS Temple being built at our request. Highly recommend!!! We had a wonderful time with a great driver. He showed us everything we wanted to see and more. We didn't have to wait for a whole bus load of people to get back so we could go much faster. Also since we had a smaller car we could get dropped off and picked up much closer to the places we were going which saved time. The driver was very knowledgeable and could tell us about every place we went. I would greatly recommend this. Driver/Guide was wonderful. He acted like an old friend taking us out for a visit, Great Job! Our driver, David, was excellent. He listened to our desires and planned the day perfectly - seeing everything we asked about.